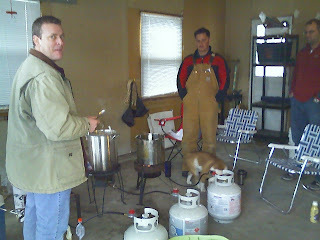 This past weekend we brewed up three batches of brew. We also broke a new brewer into the hobby when by wife's cousin Bryan (Yes MNB, spelled like Bryan Adams, no need to get all giddy) joined us and brewed up an extract batch. 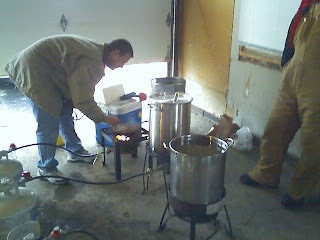 When the day was all said and done, we had brewed up about 20 gallons of beer. 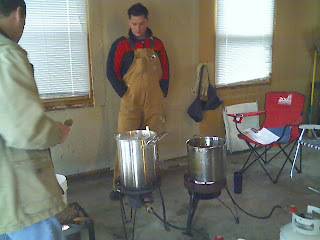 Nick and I brewed a 10.5 gallon of Belgian wit I named Ongenaet Wheat - after Belgian SU Basketball player Kristof Ongenaet. If you haven't seen the guy play, he's a warrior, total scrapper. Against Marquette he stole the ball and did a 1 on 4 coast to coast where he dunked and drew the foul. I couldn't find that highlight, but here is Arinze Onuaku breaking a backboard at the midnight madness game. 'Cuse may have been snubbed from the big dance, but this beer is going to help wash away the pain. We also used 2oz of sour orange peel, 1tsp of crushed coriander, and 2oz of grains of paradise. It weighed in at 1.044 making this a summer sensation. This beer came in a little light for the specs, but I would say that a lot of that had to do with the new mash tun clogging. The OG should have been 1.047 and it wound up 1.041. I have since fixed the issue with the false bottom and moved back to the braid - old faithful - it always works! Steeped grains for 1/2hr at 158f, added 1tsp of gypsum. We dumped in the extract, brought it to a boil and topped it off with water once it was cooled off to give him the proper quantity. The OG was about 1.049 with 33 IBU's. Going forward, I would replace the light LME with dark, increase the BP from .25 to .5, and the roasted barley to .75. Right now he is light for the color (about 26SRM) and could use some more hopps. With that said, it should still be a good beer for his first time out. WHEN A MAN... LOVES A WOMAN!!! 20g of beer, sounds like a long FUN brew day. My buddy and myself are planning on a 10g brewday, that seems much less 20g. marcus, we take pride in our math skills down here in the south. 10 is almost half of 20, so you're right in feeling that way. Don't mind the heckling of Jonathan, the trailer park only has one computer so he tries to get in as much as he can until his turn is up. 20g is a big day. Are you using a 15gal brew pot for your 10 gal batch? You'll find that it's way more inexpensive to do larger batches. Plus you still want to do more!